Today’s post will be a little bit different than the others. It will be a review and cover of the tournament I recently played. I will tell you more about the table tennis tournament, the equipment how we used, and something everyone’s wondering. How did I do, right? All I can say it has been a lot of fun, especially because I haven’t played a lot of table tennis lately. 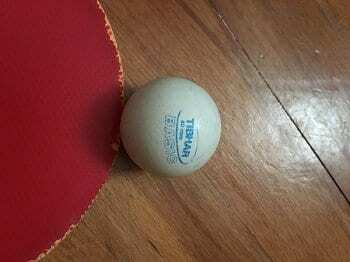 It brings good old memories back, and more excitement and motivation to play table tennis more often. I hope you will enjoy this post as much as I enjoyed the tournament! I live in a small town in Croatia, Europe. We used to have a local table tennis club, unfortunately, it’s hasn’t been active past few years. On a good side, there’s still all the equipment left, including the tables, nets, barriers, and even the table tennis robot for practice. Every once in a year, there is a local tournament for recreational table tennis players organized. 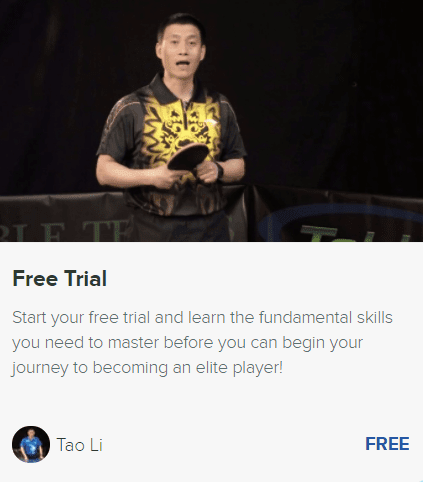 This year, I was very excited to go, hang out with other table tennis players, and what’s most important – play table tennis again after a while. It was a pretty small tournament which was held in a big modern sports center we have in our town. We had it all for ourselves, with plenty of space. The tournament was divided into two categories. Juniors and seniors. Juniors were players who were up to 16 years of age, while seniors were players who are at least 16 years old, or older. The system of the tournament was “round-robin” type of tournament. It’s a system where each player plays against every tournament contestant. In each category, of course. Since it was a small tournament, which wasn’t published anywhere else other on the Facebook, there weren’t many contestants. There were 6 contestants in the senior category, and 4 contestants in the junior category. Therefore, we used three tables which were enough. 2 tables were used by senior category and one table was used by junior category. As mentioned earlier, we used three tables for our tournament, since there were not that many competitors. The first table we used was Butterfly Octet 25. It’s one of my favorites, and definitely one of the best tables in the tournament or that local table tennis club owns. I played most of my matches on that table, as it can be seen in the photo. Two other tables were Tibhar Smash 28 R. They’re one of the top tables we had in our local table tennis club. Tibhar Smash 28 R is my second best table. Nets we used were Butterfly Europa on Butterfly Octet 25 table and Tibhar Smash net on both Tibhar Smash 28 R tables. They’re really good nets and were matching the tables we were playing on. Since we had a lot of space, we placed a few barriers behind and in between every table to protect the ball from going too far or under other tables. Barriers were simple Joomla barriers that we had available. Since most of the people were recreational players, tournament organizers provided some rackets for people who didn’t have their own rackets. I am not sure which brand they were. But they were still pretty good from what I have seen. I played with my own racket which has Butterfly Tackiness Drive forehand rubber, and for backhand, I use Yasaka Fusion. I’m a big fan of Butterfly and their equipment. With Butterfly Tackiness I am able to get a lot of control, with a good amount of spin and speed on the ball. Yasaka Fusion on backhand provides me with aggressive speed and spin, with less control on the backhand side. 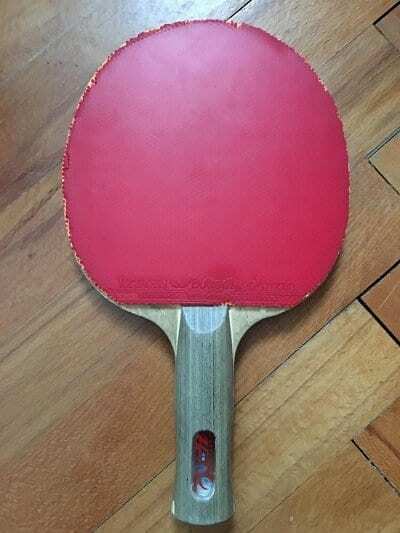 If I start playing table tennis competitively again, I would definitely get Butterfly Tenergy 05 on both sides. For the blade, I would get Butterfly ALC Timo Boll Carbon. We had two different type of balls we used for this tournament. The choice was either “Butterfly 40mm Fight Fair Play Friendship” ball or “Tibhar ITTF Approved 3 Star” balls. I preferred Butterfly 40mm ball and played most of the tournament using that table tennis ball. There were 5 other players in the senior group whom I played against. I started playing with my first competitor and won first set easily. However, suddenly I lost concentration and therefore lost 1-2. I think my competitor found a flaw in my playing style and used it against me to win the points. I did my best, however, I lost the first match, even although I regretted it, knowing I was able to win it. After my first match, there were 4 other players left to play with. I knew I had to win 3 or more of them to get to the semi-finals or finals. I was able to easily win all 4 of them, with average 2:0 result in sets. When we all finished, a player whom I lost the first match, and I had the same number of points. We ended up playing against each other in finals again. I was faced with the same competitor I lost the first match. This time, I was sure I will win since I really warmed up after not playing for a long time. However, things didn’t go that smooth. I lost the first set. The second set was hard, but I managed to win it. We drew 1-1 in sets, and whoever wins the next set, will be the winner. Unfortunately, the same thing happened in the first match when I played against the same player. I was beaten. It wasn’t easy, but I lost. Points don’t matter once you win the set. I won the second place. I was pretty pleased with the second place, even although there were only 6 competitors in the senior category. Prizes weren’t anything big and worth mentioning but were still prizes, and that’s all it matters. I really enjoyed playing and was pleased with the second place, even I didn’t play table tennis in a while. I got a lot of motivation for table tennis again, and I am definitely waiting for a chance when I can be able to play it again. We were really lucky to have such space and equipment available to us. The organization was perfect, and the only thing I would like to change is the number of competitors. It would have been a lot more fun if there were more players. I am definitely looking forward next one, where I will do my best to win it. I hope you enjoyed this post! What was the most recent tournament that you have played? What equipment do you use?